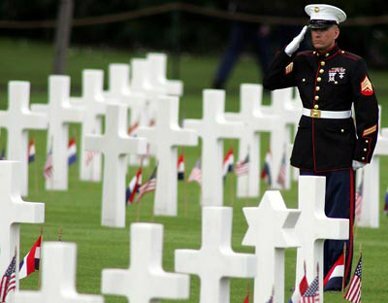 Today is a day to honor and remember those who sacrificed their lives for our Nation. Today I remember two young men, heroes, that I served with. SGT James Feeney, killed in action on February 2, 1969, and SGT Thomas Robertson, died of wounds on April 12, 1969. These young men are two of the eighty-seven members of A Troop 3rd Squadron 4th Cavalry who did not return from the Vietnam War. These men were among the best and brightest of their generation. We can not repay their families for the suffering and sacrifice the families have endured. We can honor those who have fallen and never forget their heroism. As I watched protests in Arizona this weekend, I hope the protesters both for and against Arizona SB1070 realize the reason they have the right to protest is because of the servicemen and servicewomen who sacrificed their lives to maintain our freedoms. Our military personnel who are deployed now are protecting our rights and freedoms. Keep them in your thoughts also this Memorial Day.